A guest speaker from a closed country will be here tomorrow evening to share stories from their own life and share stories of changed lives. Snacks will be provided at 6:00 PM and worship will begin at 6:30 PM. Switch Middle School Ministry will begin at 6:30 PM in the student center and the Children's Ministry will open at 6:30 PM. We will remember the unbelievable sacrifice made by Christ through Communion this Sunday during both worships. 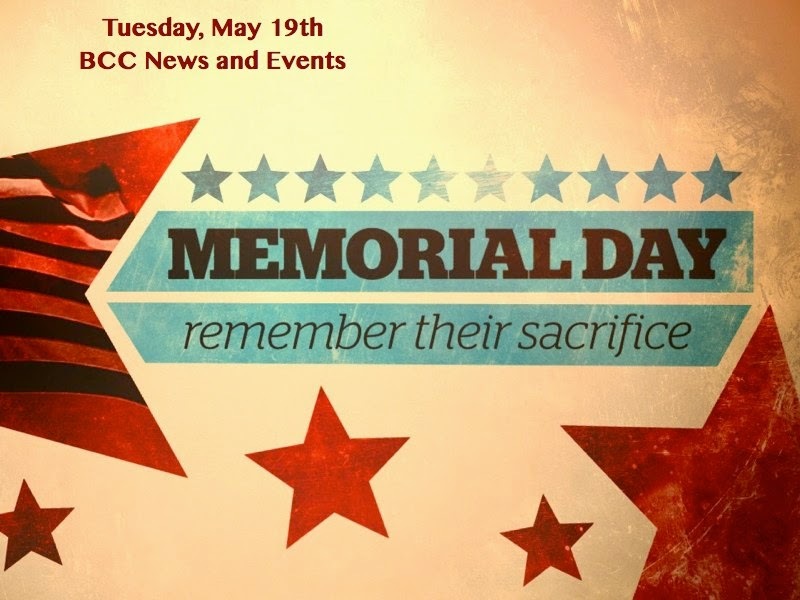 The church office will be closed next Monday, May 25th in observance of Memorial Day. Parents of high school graduates, please email 6 to 7 photos of your graduate to brett@brevardcommunity.org by May 27th. These pictures will be portrayed in the graduation presentation on Sunday, June 7th. Help send our high school mission team to the Dominican Republic this summer by enjoying a day on the Cummings Cove golf course. The golf tournament will be held on Sunday, May 31st at 1:00 PM. Cost is $75 to play. Email brent@brevardcommunity.org to register. Tuesday, July 7th through Friday, July 10th are the dates for VBS. It will be from 9 AM to 12 PM. This is free for students who are 4 years old by September 1st, 2015 through rising sixth graders. Mark this week on your calendar so that your children will be able to participate. To register your child or volunteer, visit www.brevardcommunity.org and click on Forms on the right hand side of the webpage. To volunteer, click on Worker--VBS Sign Up. To register a child, click on VBS Children Sign Up.